If you’re in college, you’ve probably heard a lot about study abroad. Going abroad means being able to study in a foreign country (and sometimes in a different language) while also having the opportunity to travel, meet new people from around the world and explore a new culture. It’s a once-in-a-lifetime chance to spend some time outside of your everyday college campus–there are study abroad programs across the globe. Even if your college or university does not offer a study abroad program in a place you’d like to see, there’s a high probability that another school does. Through study abroad, you have the chance to live in places you may never have considered before–I know people who have studied in England, South Africa, Morocco, Ireland, Switzerland, Italy, Australia, New Zealand, Germany, France, Kenya, Mexico, Ecuador, Argentina and other amazing countries! The options truly are endless. I decided to go to Madrid, Spain for my study abroad period last spring. I perfected my Spanish through three language and literature classes, a home stay with a Spanish family and an internship at a sports marketing agency in the city. I also learned about the history and culture that makes Spain such a wonderful country. It was an eye-opening, life-changing experience! Going abroad is becoming more and more common among college students. Every year, over 350,000 American students pack up their suitcases and study abroad. In the last decade, study abroad participation has seen a 130% increase in American college students. While close to 40% of students chose to go during their junior year, most schools offer programs open to sophomores and up. Surprisingly, only 6.2% of study abroad students go for a foreign language. No matter what your major is, there’s a chance to get out and see the world! If you’re considering study abroad, make sure to look up programs at your school, as well as other universities. Take time to research a program you’re truly interested in–one you know that will challenge and change you. If you’re already going abroad, make sure to think ahead with regard to visas, plane tickets and travel insurance. Don’t leave any important paperwork until the last minute! 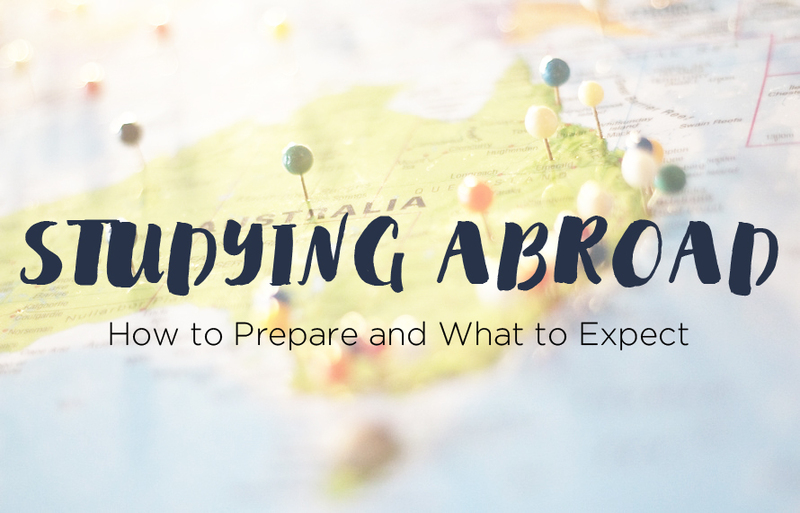 If you are studying abroad this upcoming semester, you’ve (hopefully!) done your research and gotten all your paper work ready, but there are still plenty of things to do. 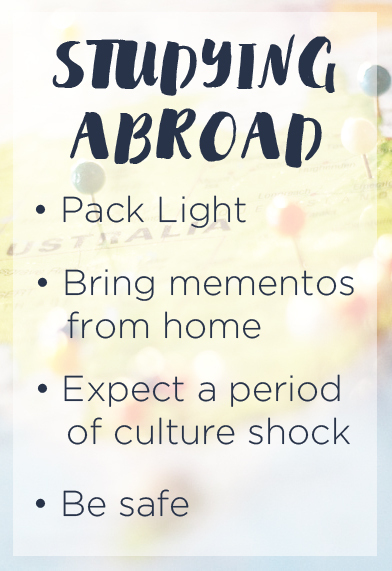 Before traveling abroad, here’s a fun checklist for what you should do and bring before you board that plane! Pack light. Most likely you’ll be traveling alone or with others who are also studying abroad, therefore, you’re the only one who will be carrying your stuff. In many cultures outside of the US, there is not as much of an emphasis on “new” and “excess” – it’s okay to wear the same outfit more than once. Pack only what you’ll need while you’re away and things that can be used for multiple purposes – your favorite outfits, comfortable shoes, exercise clothes that can double as pajamas, and one dressed up outfit. Your wardrobe will vary greatly depending on where you are going, but remember to pack smart. When you’re away, you’ll find yourself gravitating to only a fraction of what you bring with you – eliminate the wasted space. For me, being in a foreign culture meant I gravitated toward my favorite outfits time and time again since those are what I felt most comfortable in while adjusting to new surroundings. Bring mementos from home. I know, I said pack light, but you should bring with you some photographs of family and friends as well as a few souvenirs for the friends you meet abroad. 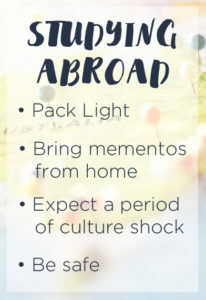 You WILL go through at least some culture shock and having reminders of home and the people you left at home will help you feel less lonely during the initial shock phase. Expect a period of culture shock. When studying abroad and living abroad for a few months, culture shock is unavoidable. Many studies and articles portray culture shock as a bell curve – at first it is fun and exciting, then you assimilate more and realize the differences and barriers in culture and become lonely, and finally you adjust, understanding and appreciating the differences in culture and recapturing the excitement of being abroad. While you will experience loneliness, make sure to put yourself out there, make new friends and beat that loneliness! You will come through it. Get out there! 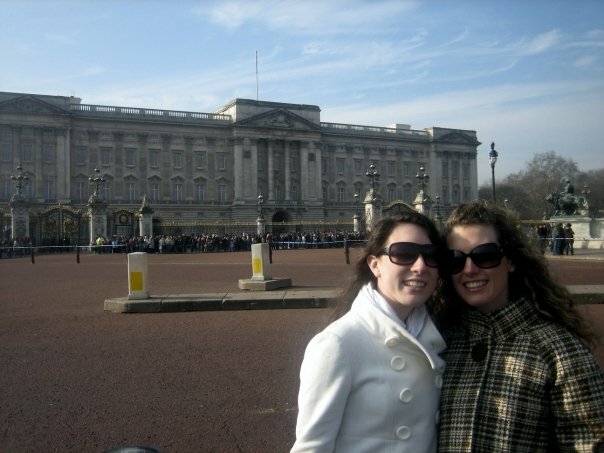 For many, you will only study abroad or even live abroad once, so take advantage! If you can travel, travel. If you can make new friends from your host country, make those friends! Try new cuisines and activities, spend time getting to know your host family, and visit every tourist trap and museum. Get to know your city, get to know the locals and take it all in! Experiencing the new culture around you is just as much a learning experience as the classes you’ll take abroad – so do your homework! Be safe. Do your research before you go to make sure you know of any dangerous areas in your city, crime problems, or health advisories in the area in which you will be studying. The Students Abroad site by the Department of Consular Affairs is a great resource:http://studentsabroad.state.gov/index.php. Learn how to best manage an emergency situation abroad, more about local laws and they have an awesome handy-dandy packing guide. It never hurts to be prepared! But perhaps most importantly, have fun and stay safe this semester!